The Pennsylvania Railroad built tunnels under New York City's Hudson and East Rivers, connecting New York with New England, and terminating in one of the greatest architectural achievements of its time, Pennsylvania Station. It covered nearly eight acres, extended two city blocks, and housed one of the largest public spaces in the world. But 53 years later, the monumental building was destroyed. 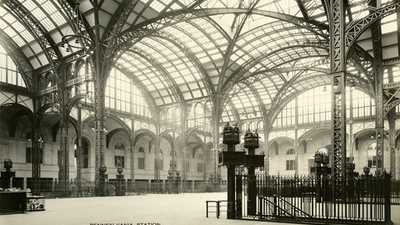 Penn Station took four years to build, and used 27,000 tons of steel, 500,000 cubic feet of granite, 83,000 square feet of skylights, and 17 million bricks. 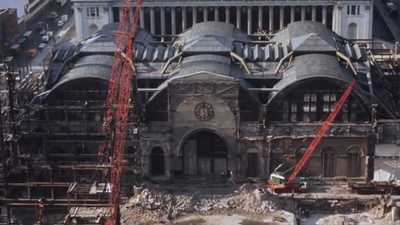 Demolition of the original Pennsylvania Station — once a crown jewel of New York City architecture — began in October 1963. 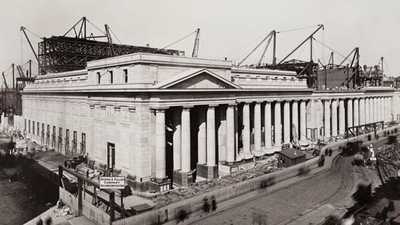 The year 2013 marked the 50th anniversary of the start of demolition of the original Penn Station. Today, there is much debate over the future of the current Penn Station.